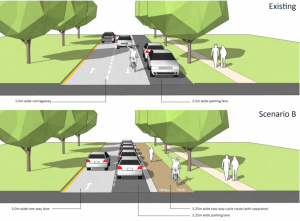 Want to cycle from Clifton to Henbury along a safe segregated cycle route? No we’re not joking; we don’t mean messy, sub standard national cycle route 4 but a new route along Westbury Rd, Falcondale Rd and Passage Rd, protected from motors. There is currently a consultation on new bus lanes on the A4018, which don’t seem popular locally. It’s not ambitious on cycling either; a new route on the Downs and, perhaps, traffic reduction in Westbury Village. Our meetings with Council Officers suggest, however, they’re seriously interested in a AAA (all ages and abilities) cycle route so may be something good can come of it. Qu 6 (Westbury Village) Please strongly support the reductions in rat running and restrictions on motor traffic. Our full response for those interested in the detail. The Downs. No Cycling? Or a car-free leisure route? Why we need space for cycling on the Downs. The annual Cycle Sunday event is a brilliant way to demonstrate the huge demand for car-free cycling around the Downs to the Downs Committee, who manage this beautiful area. (To those unfamiliar with Bristol, the Clifton and Durdham Downs lie to the north of the city centre and overlook the ecologically significant Avon Gorge). We can expect between one and three thousand people to attend these family-friendly events (depending on the weather). People of all ages and abilities come to enjoy a stress-free cycle without the worry and ‘woosh’ factor of passing cars. We think it would be brilliant if people could ride like this on the Downs any day of the year and wonder if you do too? Sadly, at present, there are only two short sections of cycle path near the Downs – Stoke Road and Westbury Road. Neither take people to the most beautiful and peaceful areas, and the rest of this 400 acres of flat parkland (in a very hilly city) is a no-go zone for family cycling. 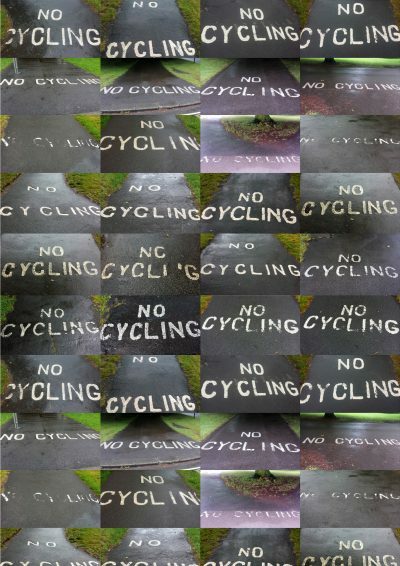 A bylaw from 1861 prohibits cycling, and visitors are “greeted” with painted NO CYCLING signs at all arrival points. Could the cycling ban change? In 2015, a comprehensive report (the Downs Place & Movement Framework v1.1) on cycling and walking was written and presented to the Downs Committee (which is jointly run by Bristol City Council and the Merchant Venturers). Unfortunately, none of the report’s recommendations have been properly developed in the two and a half years since it was written. There has recently been a low key, behind the scenes discussion about joining up the existing paths near the A4018 Westbury Road, but without any robust work on funding to make it a reality. In contrast, the Downs Committee are drawing up plans to re-develop the toilet block at the Seawalls into a café with toilets and have found a grant as well as money in their reserves to build it. We think this is a great idea and are going to be campaigning for them to find additional funds to incorporate cycle paths into the project so that visitors of all ages and cycling abilities can get to the café by bike. Longer term, we think it would be brilliant if there was bike hire near the water tower to improve access for people from all over the city who could get the bus up to the Downs and jump on a bike. It would be fantastic if you could support our campaign for cycling infrastructure on the Downs. Why not join Bristol Cycling now! (Please join here). We can do the hard work lobbying, knocking on doors and generally mithering the powers that be, so that you don’t have to. By joining, we can update you on the campaign. For example, we might ask you to sign a petition, or send a short email to your local councillor. 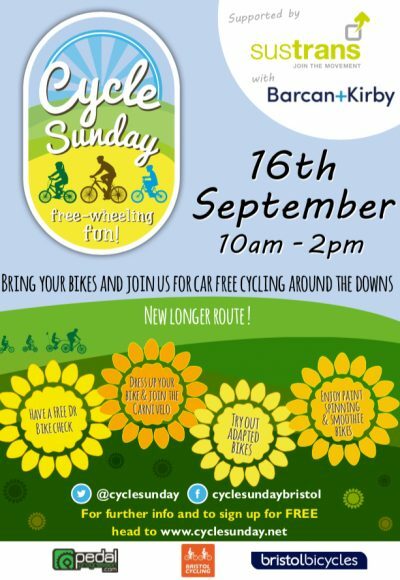 Cycle Sunday is a community led cycling event held on the Clifton Downs. It was started by a group of parents as a way of demonstrating to the Downs Committee the huge interest in opportunities for car-free cycling around the Downs. The events are very popular, with between two and three thousand people attending. The organisers basically close roads on the Downs (this year it will be a longer route including both Circular Road and Ladies Mile) so that people of all ages and abilities can have a relaxing and car-free ride together. This year’s event is on September 16th from 10am to 2pm. We are supporting the event and will be there too with our Bristol Cycling information stall. Would you be willing to help make the event a great success? Cycle Sunday would love you to volunteer as a steward on the day. They currently have 31 stewards signed up but need at least 65. In particular, they need a few more to cover new access points on the longer route. Please email downscycle@gmail.com if you can help. Thanks so much and hope to see you on the 16th September. 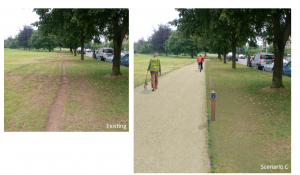 The Southmead Quietway is part of the £19m Cycling Ambition Fund to upgrade walking and cycling routes across the city. It links one of the busiest cycle routes in the city, Gloucester Road, through residential areas with high levels of cycle use, to the Southmead Hospital and north Bristol. It is identified as important ‘local link’ in the neighbourhood plans of Bishopston, Cotham and Redland, Stoke Bishop, Westbury-on-Trym and Henleaze, and Horfield and Lockleaze. Here’s our view on the two consultations for crossings on this route BCyCResponsetoSouthmeadQuietway-CairnsRoad. The Southmead Quietway is a useful route linking one of the busiest cycle routes in the city, Gloucester Road, through residential areas with high levels of cycle use, to the Southmead Hospital and north Bristol. It is identified as important ‘local link’ in the neighbourhood plans of Bishopston, Cotham and Redland, Stoke Bishop, Westbury-on-Trym and Henleaze, and Horfield and Lockleaze. We are however concerned that the entire quietway concept of using quiet roads in built-up areas will only make a marginal contribution to encouraging large numbers of people to cycle in Bristol. We feel that they demonstrate little real ambition for cycling in the way that must surely be intended for Cycle Ambition Fund projects. Parallel zebras are a new concept and a number of concerns were raised in national discussion of the concept (http://content.tfl.gov.uk/cyclists-use-of-zebra-crossings.pdf, http://content.tfl.gov.uk/shared-zebra-crossing-study.pdf). These included possible enhanced risk for mounted as opposed to dismounted cyclists, continental models for vertical give way signing, and using stripes for the whole width (http://www.cyclinguk.org/sites/default/files/tsrgd1406_plingwood_tsrgd2015_response.pdf and as used at Wade Street on the Frome Greenway). The design inserted in circular TSGRD 2016 does not appear to include either the vertical signing or the overall stripe concept (http://tsrgd.co.uk/pdf/tsrgd/tsrgd2016-circular-01-2016.pdf). The enhanced risk arises from the greater approach speed for cyclists compared to pedestrians, combined with driver unfamiliarity. The parallel crossing is basically an attempt to create a crossroads without marking it as such.The underlying, existing, contradiction in all this comes from the divergence between the law (on zebra crossings, ‘Every pedestrian, …., before any part of a vehicle has entered those limits, shall have precedence’, and practical official advice: ‘cyclists will be urged to slow down’ (Hackney) ‘Zebra crossings. Give traffic plenty of time to see you and to stop before you start to cross.’ (Highway Code, rule 19). The contradiction will become worse in situations where drivers will see someone who is not a pedestrian, acting as though they will be treated as a pedestrian, but moving much faster, and unlike a pedestrian, not able to jump backwards if they misjudge drivers’ intentions. Entrance to Southmead Hospital grounds from Kendon Drive. This is a most unwelcoming entrance for pedestrians and cyclists.There is a locked dilapidated gate, and a driveway normally occupied by two parked cars, leaving a narrow way in through a side gate. This is the responsibility of Southmead Hospital, The Sustainable Travel Co-ordinator at Southmead Hospital tells us that “With regards to Kendon Way, the Trust are aware of the issue with this entrance and have development plans to improve it once funding becomes available (in the new financial year at the earliest). This entrance is part of our Path to Wellbeing walks at the hospital so we are really keen to make it more accessible, as well as look a lot nicer.” The highway immediately outside could be improved as well. Is the CAF team liaising with Southmead Hospital about a joint approach to improving the entrance? We welcome measures to control motor vehicle speed on Kellaway Avenue / Coldharbour Road. We are however concerned that this measure does nothing to improve the situation for those cycling on this well used route. In fact the narrowing may make the situation worse in the short term and do little to ‘cycle proof’ for future measures. Note that this is a key part of the proposed ‘Universities Link’ as set out on the Stoke Bishop, Westbury-on-Trym and Henleaze page of our website (“Linking Bristol’s Universities through the heart of residential student-land. From Bristol Uni Queens Road to the Railway Path in Fishponds via the Clifton Suspension Bridge, Downs and UWE Frenchay, Glenside and St Matts”). 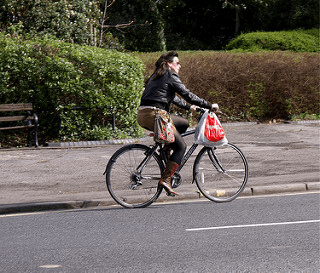 The proposals are likely to be confusing for cyclists to use due to the complex layout and interaction with pedestrians when hopping on and off pavements. We also have concerns about ambiguity and conflict with pedestrians. There should be cycle exemptions on the right turn bans into Cairns Road, and onto Coldharbour Road. We wonder whether the real need would be best served by a simple arrangement placing a conventional zebra so that its boundary lines up with the Cairns Road kerb, with a contraflow allowing straight across cycle movement, and the zebra available for walking across by less experienced cyclists, or at very busy times. 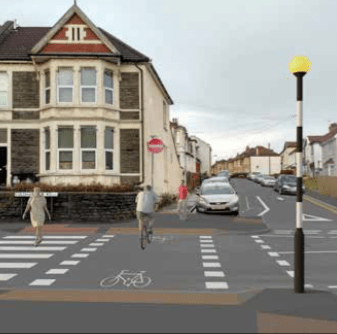 There are similar situations at two crossings of Falcondale Road (Great Brockeridge – Westbury Road, and Abbey Road – Lampeter Road). It is unclear how as a cyclist you get from the pavement on to the road after crossing Wellington Hill West. In particular, going north, parked cars will block the view of motorists travelling south down Kendon Drive of a cyclist crossing on to the road. The parallel zebra is intended to serve low usage situations, with unanswered questions about safety. The range between usage too low to justify a crossing and too high for the crossing to be safe is probably small. It is not clear who the target users are. The natural gently curving cycle routes are blocked by build-outs creating dog legs, and the dog legs may also hinder sightlines by making part of the SE approach to the crossing oblique. The pavement routing for cycles, which does not appear to be marked as such, will produce conflict with pedestrians that would not raise from a road routing.